The United States test-fired an unarmed Minuteman III intercontinental ballistic missile (ICBM) from Vandenberg Air Force Base, California, on Nov. 6. “Test launches provide valuable data for U.S. Strategic Command and the U.S. Air Force. A reliable test launch occurs when a test missile launches, completes its flight path within a designated safety corridor, the equipment functions properly, sensor data is collected, and the reentry vehicle impacts where targeted,” Global Strike Command officials told KSBY News. The ICBM lifted off at 11:01 p.m. PST towards an area in the Central Pacific Ocean near Kwajalein Island, Edhat.com reported. The base said that these tests are carried out about four times each year. They are routine and not related to real-world events. 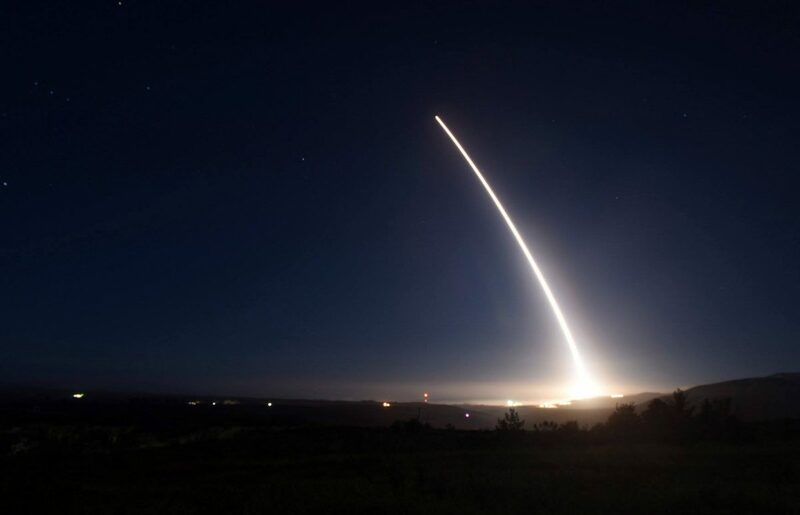 Air Force officials say the tests are done to gain information about the reliability and accuracy of the Minuteman III system. The last test, which happened on July 31, ended after Vandenberg personnel issued a self-destruct command due to a problem in the flight, Noozhawk.com reported. The current U.S. armament consisted of 399 Minuteman III missiles as of September 2017. They’re deployed in missile silos in Montana, North Dakota, and Wyoming. It is a component of the U.S. nuclear triad, with the other two parts of the triad being nuclear weapons carried by long-range strategic bombers and Trident submarine-launched ballistic missiles. “This multi-faceted approach effectively diversifies the risk involved with a potential first-strike nuclear attack—and increases the ability of an offensive second-strike attack. While the government remains confident in the reliability of the triad as a nuclear deterrent, new dialogue has been established regarding the relevance and feasibility of maintaining specific legs of the triad in the 21st century,” reads a synopsis on the university’s website. ICBMs, the website says, are “well protected against first strike attacks (although some claim their stationary nature makes them more vulnerable).” They’re also cheaper than the other parts of the triad.